Thursday saw the announcement of the name for the new series to replace the Grand-Am and ALMS from 2014 on. United SportsCar Racing will start at Daytona with the 24 Hours at the end of January 2014 with five classes of cars merged from the different categories currently competing in the two existing series. The top class will see the Daytona Prototypes, LMP2 and the Deltawing run as the new Prototype class. Prototype Challenge (PC) will be retained from the ALMS, as will GT Le Mans (GTLM) which will consist of the cars from the current ALMS GT class. GT Daytona (GTD) combines the Grand-Am’s GT class and the ALMS’ GTC class, and finally the GX Class is retained from the Grand-Am structure. For the drivers it is something akin to spending three stints of two hours inside an overheating, out-of-balance washing machine. So why are we here this weekend? To celebrate (it is Sebring after all) and to start the process of laying to rest the American Le Mans Series with the 61st running of the Sebring 12-Hour Race, or to give it is official title, the “Mobil 1 Twelve Hours of Sebring fueled by Fresh from Florida” sponsored by the Florida Lottery. The Florida Lottery could be the sub-title for the race every year, given the nature of the track and that it is usually the first race of the season. The track was originally a WWII Army Air Base called Hendricks Field and after the war, like many similar facilities it became a converted venue for road racing. The track is laid out on the old concrete runways and taxiways of the airfield, and over the years the concrete has moved and deteriorated, meaning that it punishes both the cars and drivers like no other circuit I can think of. As a dress rehearsal for the big one, i.e. Le Mans, it is considered ideal by the engineers as they figure that if they can build a car to compete at Sebring for 12 hours, 24 hours on the beautifully smooth Circuit de la Sarthe should be a breeze. For the drivers it is something akin to spending three stints of two hours inside an overheating, out-of-balance washing machine. Tommy Milner on the grid before the race. Oliver Gavin already ahead of the Risi Ferrari (#62) at the first corner on Lap 1. The race started great for Corvette Racing as Olly Gavin in the #4 took the early class lead from 2nd place on the GT grid behind the pole sitter, the Risi Ferrari. The #3 had an early pits visit for avoidable contact, followed by a much longer stop to repair front left damage; the car eventually retired after it destroyed its gearbox. #3 Corvette showing the front left damage. The #4 had a commanding early lead throughout the first set of driver rotations, then with Richard Westbrook at the wheel, the car developed an electrical problem when the gearbox display and shift lights stopped working. Westbrook pitted and the crew frantically tried to fix the dash in a very technical manner, by hitting it as the drivers swapped over to Gavin. Olly then had to make another pit stop a few laps later as the problem persisted, and this time the crew managed to fix the problem. This dropped the #4 back into the GT field; the #91 SRT Viper took the GT Class lead and the Corvette was a lap down. Just before the 6 hour mark a full course caution helped the #4 Corvette; after Tommy Milner had overtaken the #91 Viper to get the Corvette back on the lead lap, a quicker pit stop pushed the Corvette back up to 4th in the GT Class. A full course caution bunched the field up and the #4 Corvette looked to be back in with a great chance, until Richard Westbrook was sent to the naughty step and assessed a 60 second penalty for contact with the #23 Alex Job Racing Ferrari. Oliver Gavin locking up as he pushed hard in the #4 Corvette. With two hours to go, ex-Corvette Racing driver Olivier Beretta in the Risi Ferrari 458 led by just over a minute from the recovering #4 Corvette with Oliver Gavin at the wheel. Tommy Milner took over for the final stints with still more than 30 seconds to find in the last hour. The final round of pit stops was crucial as Tommy Milner made up over 10 seconds on Matteo Malucelli now piloting the Ferrari. Final stint and 17 seconds still to make up – 33 minutes and 6 seconds to make up – 30 minutes and 5 seconds, could Tommy do it? Suddenly the #4 Corvette was right behind the Risi Ferrari; Matteo Malucelli had been squeezed out wide by one of the GTC Porsches and had to back off as he took to the grass. He then ran wide again on dirty tires in Turn 10, gift wrapping the GT Class lead to Tommy Milner in the process. 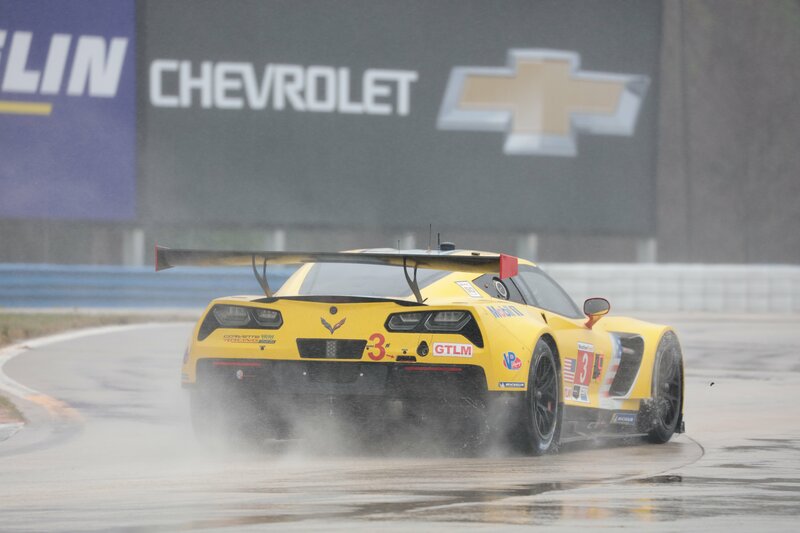 Tommy ran clean for the final 13 minutes to bring home a stunning victory for the #4 Corvette. Tommy Milner, Oliver Gavin and Richard Westbrook with their Sebring winners trophies; they also received Rolex watches alongside all the other Class winners.